That is the slogan of the international manufacturers who will be presenting 123 of the latest-generation locomotives and rolling stock at the InnoTrans 2016 Outdoor Display. From 20 to 23 September on the 3,500 metres of track, trade visitors will be able to see innovative models and products making their world debut from all areas of rail technology: from underground trains and trams to a 24-axle snable car for heavy load transportation and low floor, diesel-electric trains and high speed trains. Stadler Rail from Switzerland, for example, is presenting the new EC250 ‘Giruno’ train, which will come into service with Swiss Federal Railways (SBB) in 2017 and will begin operating in 2019 through the Gotthard base tunnel which was opened at the beginning of June. Siemens is introducing its ‘Velaro Turkey’ high-speed train and the ‘Metro Riad’, which is intended for use in the Saudi Arabian capital and has been designed specifically for the climatic conditions in that region. Among the exhibits by the French Alstom group are a fuel cell powered zero-emissions regional train. The Czech manufacturer Škoda Transportation is featuring two exhibits that are making their world debut. One is the ‘ForCity Plus’ tram with a passenger capacity of around 350, and the second is the double decker multiple unit for DB Regio push-pull services in Bavaria, on the Nuremberg – Ingolstadt – Munich route. 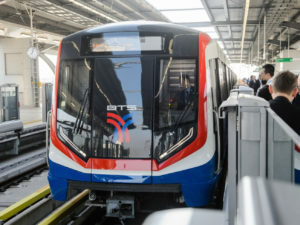 A new low-floor diesel-electric train is being displayed by the Croatian manufacturer KONČAR, while the Romanian rolling stock maker Astra Vagoane Calatori is presenting its ‘Autentic’ tram, the prototype of which has been undergoing tests since May. One freight car that is certain to attract the attention of trade visitors is the 24-axle snable car for heavy load transportation from Kübler Heavy Rail. Please see InnoTrans for original article and further information!